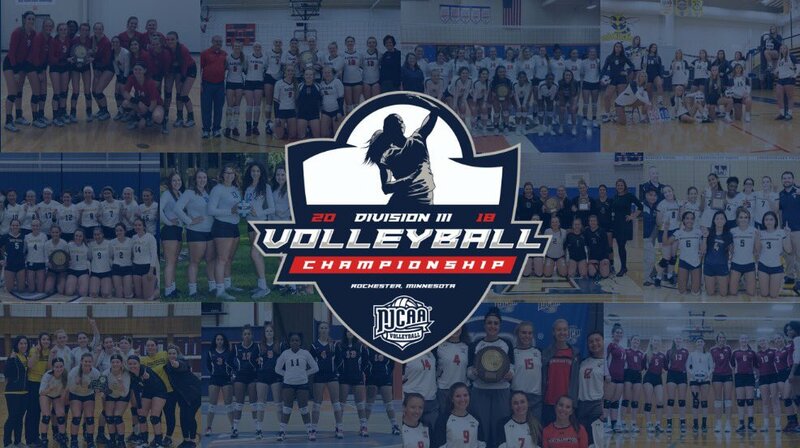 Two volleyball teams from the Minnesota College Athletic Conference will begin their hunt today for the 2018 NJCAA Division III Volleyball National Championship, as the tournament kicks off on the campus of RCTC in Rochester, Minnesota. Rochester Community & Technical College and Central Lakes College both received first round byes as the No. 4 and No. 2 seeds. Their opponents shall be determined after first round action concludes this morning. Yellowjacket head coach Amber Zitzow led her team to a 22-8 overal record and a perfect 12-0 MCAC Southern Division mark. Raider mentor Jane Peterson guided her squad to 26-4 overall mark and an undefeated 12-0 MCAC Northern Division record. MCAC All-Division teams and the MCAC All-State teams were posted earlier this month; click here for the MCAC Volleyball home page for more on those honorary teams and more. The 2018 NJCAA DIII Volleyball Championship information for live-stream, statistics, results and more are available at the NJCAA resources listed below.